Posted Thursday, Oct 31, 2013 12:01 AM EDT by HAMILTON SPECTATOR & filed under Cancer. Today we look at prostate cancer, the most common type of cancer diagnosed in Hamilton men. From 2000 to 2009, nearly 3,700 men in Hamilton were diagnosed with prostate cancer and more than 500 men died from the disease. The rate of prostate cancer deaths in the former City of Hamilton is about 23 per cent higher than the comparable rate for the rest of Canada. 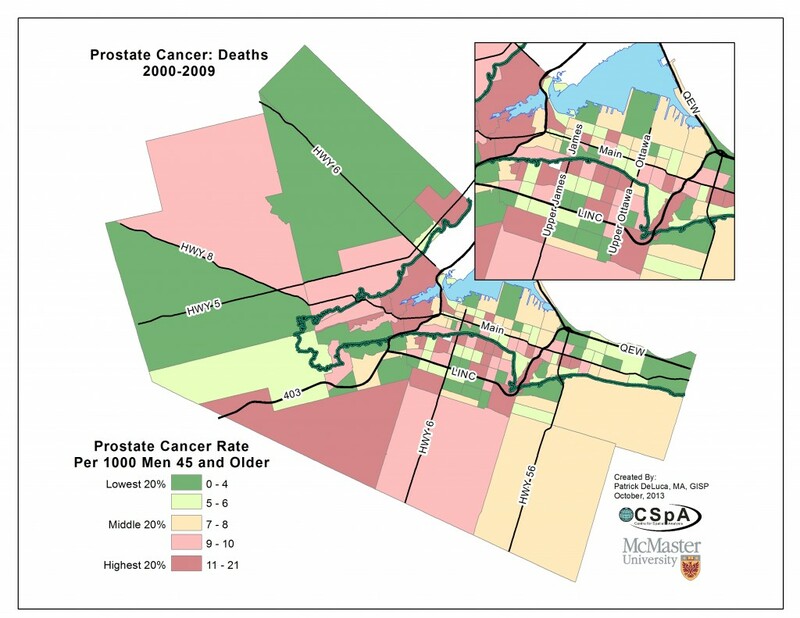 Between 2000 and 2009, there was a huge disparity in the incidence and mortality rates for prostate cancer when the former City of Hamilton is compared to the five suburbs of Stoney Creek, Ancaster, Dundas, Flamborough and Glanbrook. 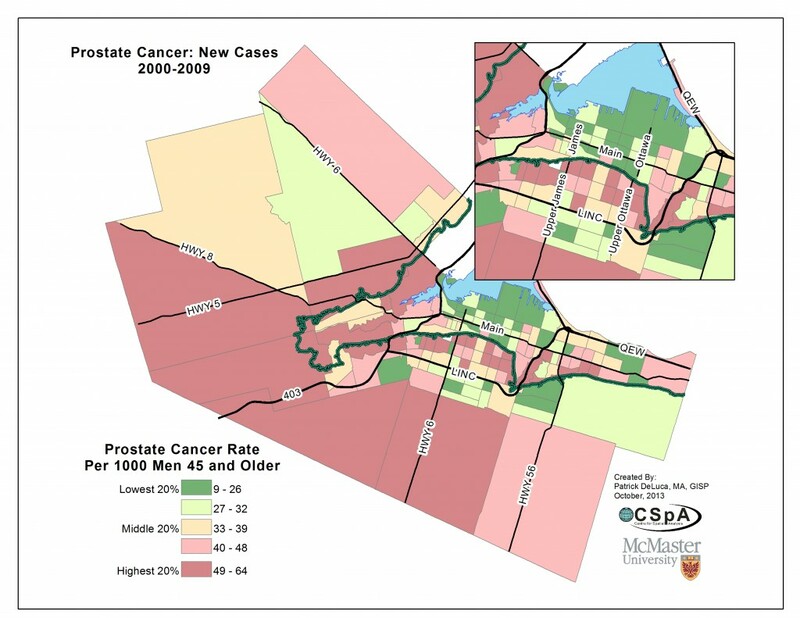 During those 10 years, the incidence rate of prostate cancer was actually 14 per cent lower in the former City of Hamilton than in the five suburbs averaged together. But the prostate cancer death rate was nearly 18 per cent higher in the former City of Hamilton than the rate of the five suburbs. Worst: The rural Ancaster neighbourhood between the Brant County border, Jerseyville Road, Alberton Road and Garner Road had the highest rate of prostate cancer incidence. Between 2000 and 2009, there were 64.1 new prostate cancer cases for every 1,000 men ages 45 and older. That’s almost twice as high as the Canadian rate. 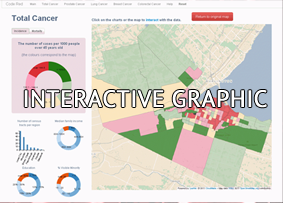 Best: The neighbourhood bounded by Wellington Street North, the harbourfront, Sherman Avenue North and the rail line north of Barton Street had the lowest rate of incidence in Hamilton, with 9.8 new prostate cancer cases for every 1,000 men ages 45 and older. Worst: The neighbourhood bounded by Chedmac Drive, San Pedro Drive, the Mountain brow and Rice Avenue had the highest rate of prostate cancer mortality, with 20 deaths per 1,000 men ages 45 and older — more than three times higher than the Canadian rate. Best: There were five neighbourhoods — three in the lower city, one on the Mountain and one in Ancaster — that had no prostate cancer deaths between 2000 and 2009. An estimated 5 to 10 per cent of prostate cancer incidence is associated with inherited genetic factors. Men who are carriers of mutated BRCA1 and BRCA2 genes — associated with elevated breast cancer risk in women — have increased susceptibility to prostate cancer. Family history is an important predictor. Men with a father or brother who had prostate cancer are two to three times more likely to develop prostate cancer themselves. Environment: Some studies have shown that exposure to the heavy metal cadmium could be associated with an increased risk of prostate cancer. Compounds found in a type of seaweed found off the Florida coast could prevent the development of prostate cancer, according to research conducted at the University of Florida. The common algae, known as sea lettuce, contains antioxidant compounds which are believed to help reduce and repair the genetic damage within a cell that can lead to the development of cancer. It’s known that men from Asian countries with diets rich in seaweed develop prostate cancer at lower rates than men in Western countries.